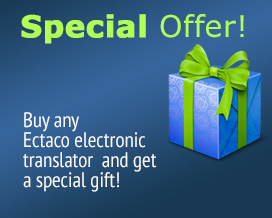 The ECTACO Partner Dictionary and Travel Audio PhraseBook EBe800 is the most popular and powerful bilingual travel companion available. With its sleek modern design, hi-res colour touch-screen and state-of-the-art language tools, it is truly in a class of its own. The exhaustive vocabulary features an extensive dictionary with more than 450,000 entries. Yet the most remarkable feature of this sophisticated handheld is the inclusion of the most advanced voice facilities in the world. As you would expect from the industry leaders, this unique device features both an advanced speaker independent speech recognition system and highly advanced English voice capabilities powered by the latest TTS (Text-to-Speech) technology. This allows for numerous learning and communication options available to frequent travellers and students alike.